Indian media figure, journalist and writer who won the CBA's Journalist of the Year award in 2007. She earned a master's in Mass Communication from New Delhi's Mass Communication Research Center. 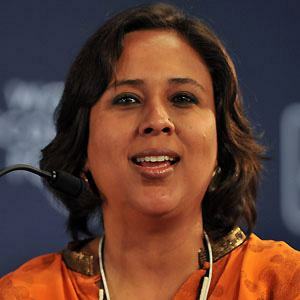 Her image was partially tarnished when she was involved in the infamous Radia tape controversy in 2010. She was born to SP and Prabha Dutt and raised with a sister named Bahar Dutt, who also became a TV journalist. She married her second husband Haseeb Drabu after being married to her first husband for just six months. She was the inspiration for Rani Mukerji 's character in No One Killed Jessica from 2008.